It has been a while since I have posted a photo of an iguana. 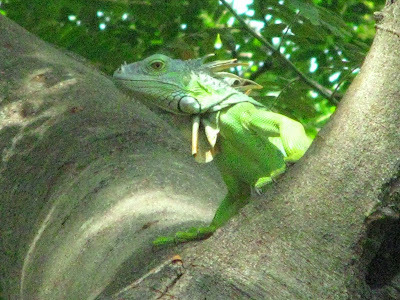 Iguanas are common in Costa Rica, and can be seen even in the middle of town in Tamarindo. Sometimes they walk in the grass beside a sidewalk, but usually they can be seen in a tree. Some iguanas are grey, some are orange, and some are green. As you can see from this iguana, the green iguanas can match the color of the leaves quite well. My adult son, Stuart, took this photo, as he is much more fond of and knowledgeable about reptiles than I am, and is more prone to see and photograph them than I am. Last year I did a post and showed a photo of the Kahiki Restaurant. Sadly, it burned to the ground. The Kahiki Restaurant has re-opened in a new spot, which is the location of the former Pachanga Restaurant. The owner of Kahiki is a young woman from the Netherlands, and I am glad her business has recovered after the terrible fire. Many of restauranteurs and shopkeepers in Tamarindo are Europeans. It brings diversity to the community and, fortunately, most of the chains have not yet arrived in Tamarindo. There are no McDonald's or similar fast food burger places. (There is subway and a Pizza Hut). I apologize that I did not take a photo of the delicious food at Kahiki this time. As is evident by the expression on my two sons, they were rather annoyed at my picture taking, and it was time to put the camera away. After showing a person fishing yesterday, I thought I would show a seafood restaurant today. The top photo is the stitching on the placemat El Balcon del Marisco. The second photo is the seafood paella I had for lunch, before they mixed it up and served it on my plate at table side. The third photo was taken by the waiter and shows my two sons and me in the restaurant. El Balcon del Marisco translates as "the balcony of the sea." I suspect that is an idiom in Spanish, although it could be a reference to the location of the restaurant on a balcony over the water feature of the Garden Plaza Shopping Center. The shopping center is located on the outskirts of town and is anchored by the Auto Mercado supermarket, which is comparable to supermarkets in the USA. It is good to start a visit in Tamarindo by sleeping in late, having a refreshing seafood lunch, and stocking up on groceries for the week. Who said fishing is calm and tranquil? Fishing in the surf, particularly standing so close to the breaking waves, can add an element of excitement to waiting for fish to take the bait. It is a good thing that this guy was wearing his swimming trunks while fishing because at times the waves would splash over the rock were he was standing. I took this photo on Playa Langosta. Part of Playa Langosta has a volcanic rock flow into the ocean, so there are great tide pools, and the rocks magnify the sound of the crashing waves. These dogs probably saw the beach volleyball players jumping around on the beach, as I have shown during the last few day. They must have decided that it looked like the people were having fun, and they decided to jump around and frolic in the sand and surf. This photo was also taken in Playa Langosta. Beach volleyball players may look serious, like yesterday, but to keep matters in balance, several of them kept some refreshments nearby in case volleyball makes them thirsty. As you can see, the beverage of choice seems to be beer. 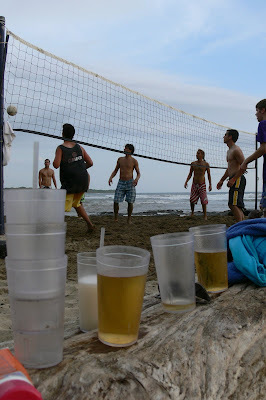 Imperial cerveza is the most popular Costa Rican beer. I have to confess that although I claim St. Louis, Missouri, home of Anheuser-Busch, as my home town, I do not drink beer. It is an acquired taste that I never acquired. I enjoy wine, but I doubt that wine and beach volleyball is a natural pairing. Volleyball can be very competitive, even if it is a pick-up game on the beach. I took a few photos of the people playing beach volleyball at the Barcelo Resort on Playa Langosta and quickly concluded that I am not a very good sports photographer, as this photo will attest. Beach volleyball is popular behind the Barcelo Resort in Langosta, about 50 yards south of our condo on Langosta beach. The beach is public property, like all beaches in Costa Rica, so people who live in or rent the condos in the area share the beach quite harmoniously with hotel guests. The tourists playing volleyball always seem to be enjoying the game and each other. They are not too serious or competitive, unlike some of the beach athletes that you see on the beaches of Los Angeles. This is the same volleyball net that I posted yesterday. Yesterday's photo showed the ocean in the background. Today's photo shows the mouth of the Langosta estuary. Across the estuary is an unpopulated stretch of Langosta Beach that is part of the 5,000 acre Hacienda Pinilla property. We can walk for miles with very few, if any, people until we reach the new J.W. Marriott Guanacaste Resort. 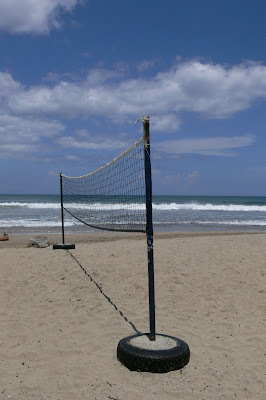 Are you ready for some beach volleyball? This beach volleyball net is set up on Playa Langosta by the Barcelo Resort which is about 50 yards to the left of our condo. Guests at the resort always look like they are having a good time playing or watching beach volleyball, and meeting each other during a game of beach volleyball, as I will show in some upcoming photos. I took this photo in the morning. The beach volleyball games pick up in the afternoon. This is a huge driftwood log that washed up on Playa Langosta near our condo. The ocean surge that I showed yesterday carried with it what had at one time been a large tree trunk that had been floating in the ocean. The ocean receded and left this large log on the beach as a souvenir, only to be washed away again. Don't worry about the loss of tree. Costa Rica planed 7 million new trees last year as part of its reforestation efforts to combat global warming and become the world's first carbon-neutral nation, a goal for 2021. This is a surge of the ocean at high tide. I love to walk along the beach because it is always in motion and changing. At low tide the beach is wide. At high tide, there can be a few spots where you watch for waves and either walk between waves or walk on a little path on the higher part of the beach. I have rarely seen waves like this crashing up on the beach. I have shown some surfers in town recently, so it is time to show another surfer catching a wave. This surfer was balanced precariously on the crest of a wave that he was riding at Playa Langosta. There is a wave on the top of this store. This building was visible in the corner of yesterday's photo, so I decided to show a photo of it today. Someone decided that a store that backs onto the beach and that sells swimming suits and beach clothes should have a wave built on its roof to emphasize what it sells. This type of vernacular architecture in which buildings are designed to imitate the products they sell was a trend in California decades ago, and perhaps that was the inspiration for this building. Are any readers familiar with the Randy's Donut Shop near Los Angeles International Airport? There are other buildings in L.A. in which camera shops were shaped like a camera, hot dog stands shaped like a hot dog, and similar "kitsch." I wonder how the architect told the builder to construct this wave. It looks rather tricky. It is common to see surfers walking in the middle of town, as I mentioned a few days ago. The beach is behind the row of shops at the end of this street, so these surfers have only about a block left before they reach their destination and start surfing. The street on which these surfers are walking is supposed to be paved within the next few months. 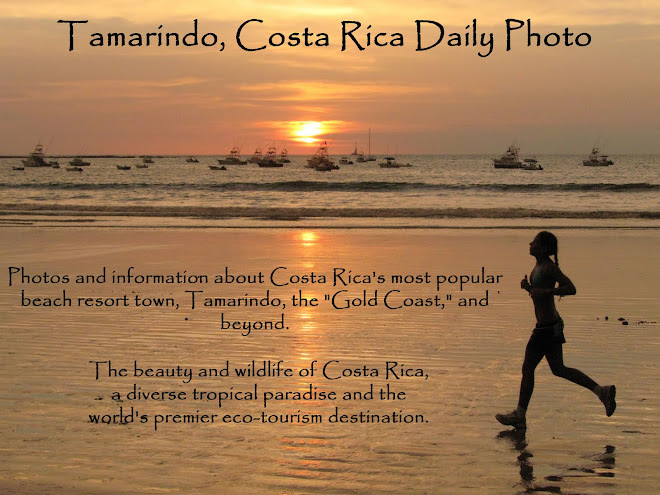 The new buildings, street paving, storm water drainage, and other improvements have been transitioning Tamarindo from a fishing village and funky surfing town into an international resort, which Forbes Magazine described last year as Costa Rica's most popular beach resort. This is a view of Playa Flamingo. I have shown some other views of Playa Flamingo that you can access by clicking on the label in the left margin for Playa Flamingo. This photo also shows the development of homes on the hillsides overlooking the ocean. The real estate market has cooled down in the past year due to the worldwide recession. There was a boom for about 5 years before that, sparked by the addition of international flights directly into Liberia, just one hour away. Home sites and homes and condos with a view of the ocean will bring a much higher price, of course, than other property, and in this photo you can see homes built high on the hills, similar to what you would expect to see in California. My wife and I decided for our two condos in Tamarindo that we wanted to buy places right on the beach or directly overlooking the beach so we could enjoy the beach and the ocean without having to get in a car. Ocean view property and property near the beach in Costa Rica can be purchased for a fraction of the price of land near or overlooking the ocean in places like California, and the ocean is warm enough to swim in all year around. Real estate in Costa Rica is more expensive than in neighboring Nicaragua and Panama because Costa Rica has much more of an infrastructure for visitors and is much more attractive for foreigners to buy property because it has such a long history of stable democratic government. The price of single family homes is not much more than the price of condos. The reason for that is there is greater peace of mind for Americans and Canadians to buy a condo rather than a home when selecting a second a home or vacation property. Particularly if the property will not be used part of the time, there is greater security in buying a condo where there is a security guard, and others to take care of the yard and exterior maintenance. This is a somewhat closer view of Tamarindo bay and beach than yesterday's photo. Above the trees that line the beach, you can see some of the condo buildings that have been built. The height of the buildings is now restricted. The developers obviously built them tall to give ocean views to the people on the higher floors, as people will, of course, pay premium prices for a view of the ocean. The tan colored building in the center of this photo is the condo building on the grounds of the Tamarindo Diria Resort. My wife and I have a condo on the 4th floor of that building. It does indeed have a nice view of the beach and ocean, and the beautifully landscaped grounds of the Diria Resort. Sometimes we stay in our condo right on the ocean in Playa Langosta, a quiet residential area about a 10 minute walk to the center of town, and sometimes we stay right in the middle of town at the Diria Resort condo. Some guests and renters prefer one location and others prefer the other. It can be difficult, but pleasant choice. This is the main part of Tamarindo beach, viewed from a boat in the bay. The southern end of the bay is protected from the ocean by an offshore island and reef. That causes the water to be calm enough to enable boats to be moored in the bay, as you see in this photo. The little boat in the foreground of this photo is an example of one the small boats that is used to shuttle people from the beach out to the fishing or excursion boats that are moored in the harbor. The area of the beach on the left side of this photo is not protected by the island and reef at the southern end of the bay, so that part of the beach is popular with surfers riding the ocean's waves. This is a street scene in "downtown" Tamarindo. I took this photo on the main street and about a half block from the main intersection in town. My guess is that this looks different than the main street in your town. 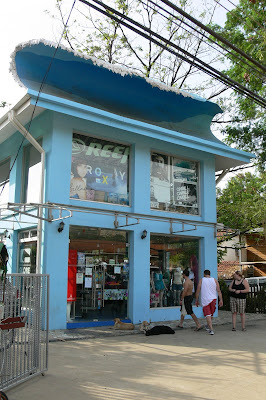 In Tamarindo, it is not unusual to see surf boards in the middle of town. 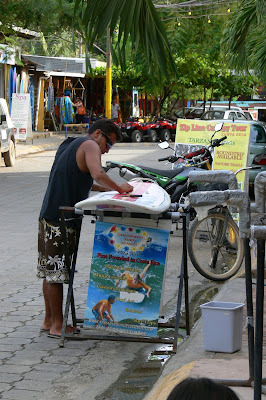 In other towns, someone might think that this man is taking up a prime parking spot by doing some maintenance or repair work on a surfboard in the main street of town. This man is in front of one of the many surfboard rental shops in town. In the background, you can see some all terrain vehicles available for rent. One of Tamarindo's leading chefs, Cordon-Bleu trained Israeli Shlomy Koren, has opened a new restaurant, Seasons. The top photo shows the restaurant, the second photo is my entree (filet mignon in red wine sauce, with fresh vegetables), and the third photo is my desert (entitled "chocolate collection"). With all of photos I have posted recently of activities in Tamarindo, I have neglected to show one of the major reasons that my wife and I decided to buy our two condos in Tamarindo -- the excellent and diverse choice of restaurants. Shlomy has been one of the top chefs in Tamarindo for years. His new restaurant, Seasons, features seafood and other entrees, with Mediterranean influences. For example, there is red snapper filet that is pan seared with eggplant and red pepper coulis; mahi-mahi with peanut ginger cilantro lime tapanad: Middle Eastern chicken; and a vegetarian Moroccan couscous, with butternut squash, zucchini, onion with turmeric and cumin. The menu also includes shrimp scampi, seafood pasta and pesto rigatoni with spinach. When I dined at Season's recently, the menu offered a choice of any appetizer, any entree and any desert for the combined price of $24 USD. While most prix fixe menus offer only one or two choices per course, my family appreciated that we could have the choice of anything on the menu for the combination price. Here is a link to the website for the restaurant. Seasons is a little hard to find. It is located at the swimming pool area of the Hotel Arco Iris. There are signs to it on the right side of the main road leading up the hill from the beach, just a block past the turnoff for the road that goes to Langosta. My wife (whose food tastes are much more highly developed than mine) and I were big fans of Shlomy's previous restaurant, Pachanga, and we are delighted that he has opened Seasons. It offers a fine dining experience at a price of about one half what one would expect to pay in the USA for a comparable dining experience. This is a later view of the same sunset as yesterday. The sun was filtered by the marine layer of clouds, which muted its colors, but provided a marbled texture to the sun. We enjoy the infinite variety of sunsets from our balcony/patio. The variations in color, texture and saturation, which can turn the entire sky fiery red or can be confined to a red ball dropping into the ocean, is a nightly work of art by Mother Nature. The sunsets are a daily reminder that we humans are mere guests on this planet, and we should behave like good house guests, always cleaning up after ourselves and leaving everything in better condition than when we arrived. Here is the early stage of a sunset, with some people enjoying the surf on the beach. I took this photo from the balcony/patio of our Playa Langosta condo. This is not the best time of the sunset, but I like the reflection of the sun on the waves from the horizon to the beach. At this stage of a sunset, the conversation on our balcony is usually something along the lines of "Do you think we will get a good sunset, or do you think that the sun will drop down behind a marine layer of clouds on the horizon." The reply is usually something like "While you are up, can you get some more cheese and crackers and refill my wine glass. This is good Malbec." Tomorrow I will show the same sunset a little later, with the sun just above the horizon. CNN reported a few days ago that a major international study ranked Costa Rica number 1 as the world's happiest nation. The key factors that caused Costa Rica to achieve this distinction were "Costa Ricans report the highest life satisfaction in the world" and have the second highest life expectancy in the Western hemisphere (behind only Canada). In addition, Costa Rica rated very high in not consuming more than its fair share of the earth's resources. The CNN article noted that Costa Rica is known for its "lush rain forests and pristine beaches." I therefore decided to illustrate this story by showing a photo of a woman relaxing in the shade with her dog on the beach right behind our condo in Playa Langosta. No wonder Costa Ricans are so happy. Does life get much better than this? The "Happy Planet Index" developed by the New Economics Foundation in the United Kingdom ranked 143 countries based on (1) what matters to people: long, happy and meaningful lives; and (2) what matters to the planet: the rate of consumption of the planet's resources. The Foundation observed that the slogan and greeting most popular in Costa Rica -- "pura vida," or "pure life" -- embodies the contentment of the population and the strong family and community ties. The Foundation also noted that clean water and adult literacy are nearly universal, and there is strong political political participation. Costa Rica was ranked as having one of the lowest rates of poverty in the developing world, even surpassing one member of the European Union. The Report gave well deserved praise for Costa Rica's compatibility with the planet's needs, commenting that Costa Rica is "Unique in the world for having combined its ministries of energy and the environment back in the 1970's, a staggering 99 per cent of its energy comes from renewable resources." The Foundation's report complimented Costa Rica for enacting a carbon tax in 1997 and using the revenues to pay for local communities to preserve their forest lands. That has led to the reversal of deforestation, with twice as much land covered with forests today than 20 years ago. I am a citizen of the USA, which ranked 114 (due in large part to its consumption of four times the amount of energy per person as Costa Rica). I am therefore not bragging when I report on these results. I am expressing my admiration for the country and its people, and my appreciation for the example Costa Rica is showing for the world. Finely detailed, hand-painted ox carts are a traditional craft in Costa Rica. Historically, the ox carts were used by small family farmers to take their products to market. For coffee farmers, that could mean a journey of a week or more out of the mountains and down to the port where their coffee beans would be shipped for export. Can you imagine the parade of ox carts through the towns and villages along the route from farm to sea? The paint on the ox carts would be a source of pride in a way that is similar to the pride that some people today find in having fancy cars and trucks. Today's photo concludes my series on Hacienda Guachipelin. Our one day visit had so many activities (zip lines, tarzan swing, rappelling, rock climbing, lunch, horseback riding, and river tubing) that it yielded 3 weeks worth of varied photos for my Daily Photo blog. (And, of course, I have many more photos that I did not show.) Tomorrow, we will return to photos of Tamarindo and the beach. For the website of Hacienda Guachipelin and more information, please click here. Tomorrow I have a post planned about some important news about Costa Rica. You would not be correct if you guessed that the news is about Costa Rican President Oscar Arias, who is serving as a mediator for the political crisis in Honduras. That is a familiar role for him, as he was awarded the Nobel Peace Prize for his role during his previous term as President in the 1980's, when he mediated a peaceful resolution of the conflicts in Nicaragua. There is some other news about Costa Rica, which I will reveal tomorrow. This is the horse corral at Hacienda Guachipelin, with a traditional Costa Rican ox cart. The horses that I showed yesterday wait in the corral for riders during the day, before returning to their pasture. Farmers and ranchers take pride in the hand painting on their ox carts. It is still possible today to see ox carts in use in rural parts of Costa Rica. Costa Rican farms tend to be smaller family farms than are typical in many other countries, and there are a lot of small family farms that are still a backbone of the economy today. This is possible because the major crop is coffee, which is grown in small plots rather than large plantations, unlike bananas. Much of the central valley areas of Costa Rica are still small farms and villages. In the dryer northwest province of Guanacaste where Tamarindo is located, there are still small family farms, although large cattle ranches are also common, with some land holdings going back in time to the Spanish land grant days. Hacienda Guachipelin is an example of one of those large cattle ranches, although it is today also used for eco-tourism and adventure activities such as what I have shown on this website during the last few weeks. I will show a closer view of the ox cart tomorrow so that you can better appreciate the fine details of the painting, and will discuss further the culture of the ox carts. At the end of the day of our zip lining, horseback riding, and river tubing, I noticed that they were taking the horses from the corral back to the pastures. The horses deserved a rest, and so did we. When I posted a photo of Costa Rican cowboys a week or two ago, I received a question in a comment from a reader about whether cowboys in Costa Rica are called gauchos, as hey are in Argentina. In Costa Rica, a cowboy is called a vaquero. The northwest province of Costa Rica, called Guanacaste after the national tree of Costa Rica, has a tradition of cattle ranching and cowboys. In many small towns in the area, their are are cattle chutes in the town square, which is usually used as a football or soccer field. In some towns, there is a rodeo ring. 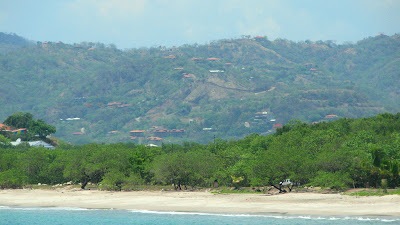 We do not have either of those in Tamarindo because we are abeach resort town that used to be a sleepy fishing village. In Tamarindo, the only cowboys walk from restaurant to restaurant and sing ballads for tips. Here is another view of the guest rooms at Hacienda Guachipelin. It does not look like a cattle ranch, as it has lush tropical gardens. I have never stayed in the rooms there, as we always stay in one of our two condos in Tamarindo and my wife and I have each gone there on day trips, but not at the same time. My wife went to Hacienda Guachipelin with our friend Sharon (who does Phoenix Daily Photo) and I went there with my two sons. My wife and I did different activities, however, as she and Sharon hiked to a waterfall and the volcanic fumaroles and did a horseback ride. She did not do the canyon zip lines or the tubing trip that I have shown during the past several weeks, although she and Sharon did zip lines closer to Tamarindo. Hacienda Guachipelin is next to Rincon de la Vieja National Park. Rincon de la Vieja has volcanoes with craters as high as 1,800 m. (6,250 ft), active bubbling volcanic activity, 32 rivers with many waterfalls, and abundant plant and animal life. After the zip lines, horseback ride and river float trip that I showed recently, this hammock sure looked inviting. We were not staying at the Hacienda Guachipelin, however, and I am sure this was reserved for guests of the lodge, so we did not rest in the hammock, which is outside the rooms where overnight guests stay. It is about 90 minutes to drive from Tamarindo to Hacienda Guachipelin. We arrived about 10:00 am and left about 4:30. All of the activities that I have shown on this website during the past several weeks occurred during that time on the single day of our visit. For those people who stay in the guest rooms at Hacienda Guachipelin, there are more activiites, including hikes to waterfalls, exploring Rincon de la Vieja National Park right next to Hacienda Guachipelin, and taking a nap in a hammock, which looked like a mighty inviting "activity" to me after our action-packed day. This is the surfer just as he was beginning to fall. I took this photo a split second after the two photos yesterday and a split second before the photo of the empty surfboard that I showed the day before yesterday. As you can see in this photo, the surfer lost his balance and leaned back too far into the wave, catching water that slowed his momentum. As my July 2 photo showed, the surfboard continued with the forward momentum and had perfect form riding the wave, without a surfer on board. After showing yesterday's photo of an empty surfboard, I thought I would show a few earlier photos of the same surfer in the moments before his fall. In the top photo he seems to be doing fine. In the second photo, however, he is leaning too far into the wave and is catching extra water that is splashing up and obscuring the view of him. Tomorrow I will show you what happens next. Obviously to get such a rapid sequence of a surfer falling I used the continuous shooting mode on my camera. I was not hoping to catch a wipe out, of course, as I would wish a long and successful ride for every surfer on every wave. I took these photos on Langosta beach, just behind our condo. A person from Texas who rented our condo earlier this month sent me an email after his stay and said he wants to come back if it is not rented for awhile and stay there and work using the internet an the USA phone line while taking advantage of what he called "epic surfing." Here is an empty surfboard having a nice ride on a wave on Playa Langosta near our condo. I considered using this photo for yesterday's Daily Photo Theme Day of "empty," but chose the empty crocodile mouth instead. The surfer in this photo had just fallen down and was hidden in the surf in this photo. Most surfers use a tether around their ankle to attach themselves to their surfboards, so surfboards like this do not get a long ride. I don't surf, but I like to watch the surfers from the beach. Here is an empty crocodile mouth about to chomp on some food. The worldwide Daily Photo Theme for July 1 is "empty," so I thought this would be a Costa Rican version of that theme. I took this photo while on a wildlife boat cruise in Palo Verde National Park. We saw probably 40 or 50 crocodiles in the wild on that trip, which took about 90 minutes or so. At one point, the boat operator stopped and held out some chicken parts to feed one of the crocodiles. I did not use a telephoto for this photo. In fact, I had the opposite problem. In some of my photos the crocodile jumped up right out of the frame where my camera was pointing. We were safely within a boat that was large enough for about 20 people, but we could have reached out and touched the crocodile if we had been so foolish. Needless to say, the river where this photo was taken is in a different area than the river where we were doing the river tubing trip. Tomorrow I will show the runner up of a photo that I considered for the theme of "empty." It is completely different. "Click here to view thumbnails for all participants" in the City Daily Photo Theme Day.